Orthodontic treatment can do much more for your teeth than simply create a more pleasing and uniform appearance – it can improve your bite, relieve jaw discomfort, improve your brushing and flossing technique, and enhance your overall oral health! That’s why the San Pedro Smiles team offers several options for our patients, including both age-old metal braces and more modern alternatives that are perfect for image-conscious adults. Dr. Gonzalez can’t wait to help your smile reach its fullest potential. Contact us today here in San Antonio, TX if you’re interested in scheduling a consultation or if you have any questions we can help you with. When the word “orthodontics” is brought up, this type of service is what most people immediately think of. Metal braces have been around for many years, and their reliability and effectiveness in improving smiles of all ages is unquestioned. 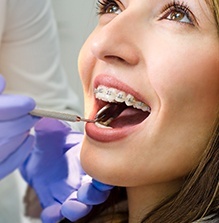 Patients will wear silver brackets and orthodontic wires that are connected to these brackets through the use of elastics. Over time, the wires will gradually guide teeth towards improved positions. While every case is different, you can typically expect this process to take a year or more to be fully effective. Of course, some teenagers and adults may balk at the idea of wearing noticeable metal braces for large spans of time. If you’re invested in maintaining a beautifully natural appearance throughout treatment, Invisalign might be the perfect fit. This technique does away with the traditional braces model entirely, replacing it with a series of aligners that are made of clear, customized plastic. The aligners are very subtle in appearance when worn, and they’re removable as well for easy eating, brushing, and flossing. 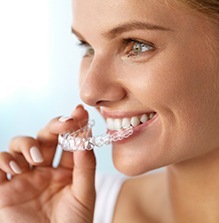 ClearCorrect is another aesthetics-friendly orthodontic option that’s similar to Invisalign. Patients will be provided with clear aligners that need to be worn for a few weeks at a time, and their removable nature allows you to continue enjoying all of your favorite foods and practicing your regular oral hygiene routine. Unlike Invisalign, ClearCorrect aligners are made right here in the United States, and patients will be provided with a few at a time instead of receiving the entire set all at once. By the end of treatment, you should see noticeably beautiful improvements! Are you looking for a speedy orthodontic treatment that can improve your smile’s alignment without years of waiting? You may want to consider revolutionary FastBraces® at our San Antonio location. Traditional braces straighten teeth in two different sessions, first starting with the crowns and then moving onto the roots. 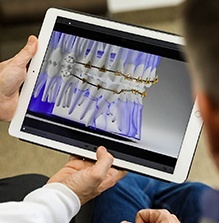 Alternatively, this modern technique shifts both portions of the tooth at once, helping patients achieve the results they want in a single year or even less.